As a food and travel writer, many trips and meals come with the job. There are a few journeys when something really special comes along and you get to eat an amazingly memorable meal. 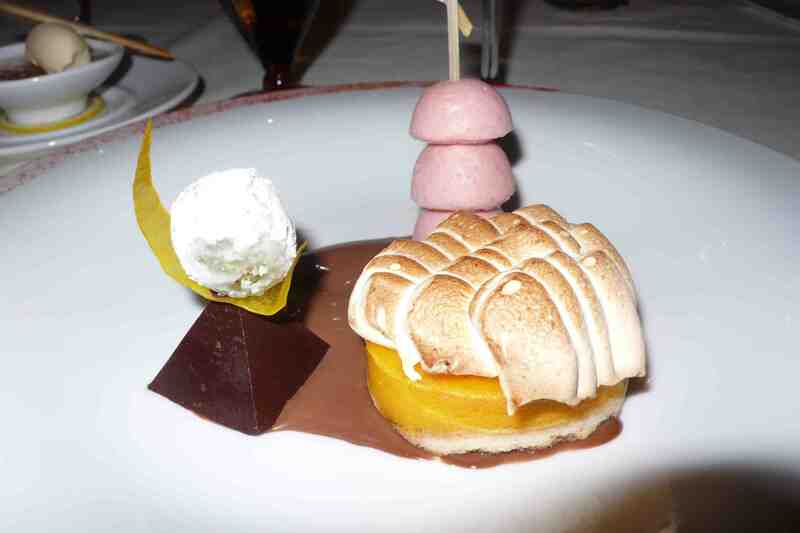 This recently happened to me at Fleur de Lys in San Francisco. Chantal Keller, Chef Hubert Keller’s wife, gratiously arranged dinner for me while I was writing a story on a romantic weekend in San Francisco. I had heard rave reviews about Fleur de Lys for years and had watched Chef Keller’s PBS show “Secrets of a Chef.” I arrived to find a dining room housing 900 yards of hand printed velvet and satin chamois in warm tones of red and green that drape the ceiling and walls with a Venetian chandelier and towering floral arrangements. I was greeted by Marcus Garcia, dining room manager and sommelier. He also provided wonderful pairings throughout my tasting dinner. I was very lucky that Chef Keller was in the kitchen (he owns various other restaurants in Las Vegas and St. Louis) and even luckier that he agreed to sit with me after the meal for an interview (below this post and under the interview section). 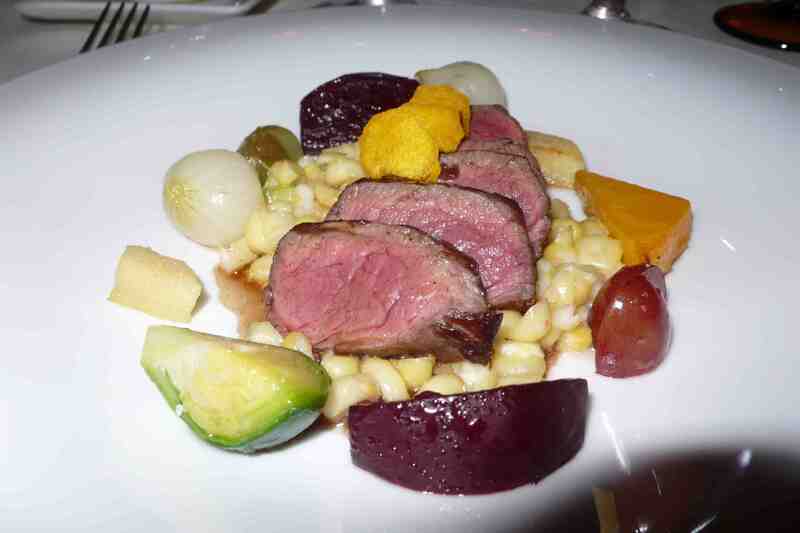 Here is what Chef Keller prepared for me – one of the best meals I have ever had the pleasure to eat. 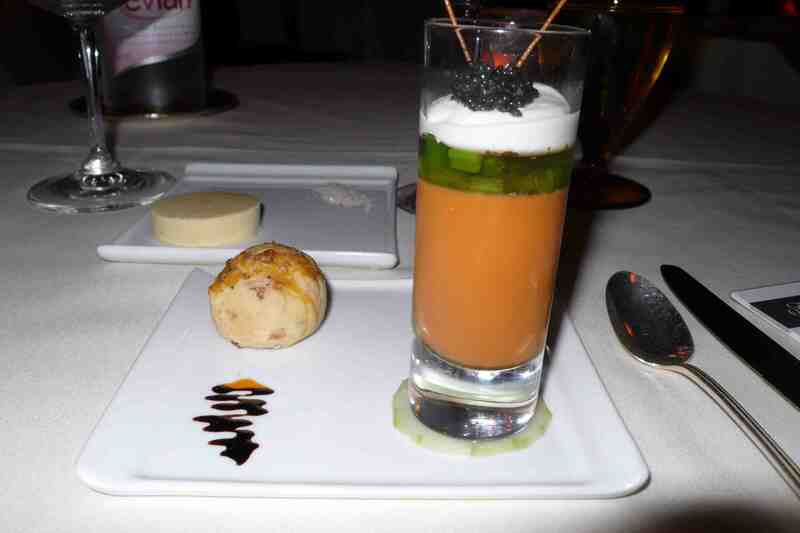 I started with a Bloody Mary Shooter, which included layers of Bloody Mary mousse, celery, and horseradish cream with caviar on top. I noticed how beautiful the dish was plated and this artful and colorful design with food continued with each course. On the side is an onion briouche. 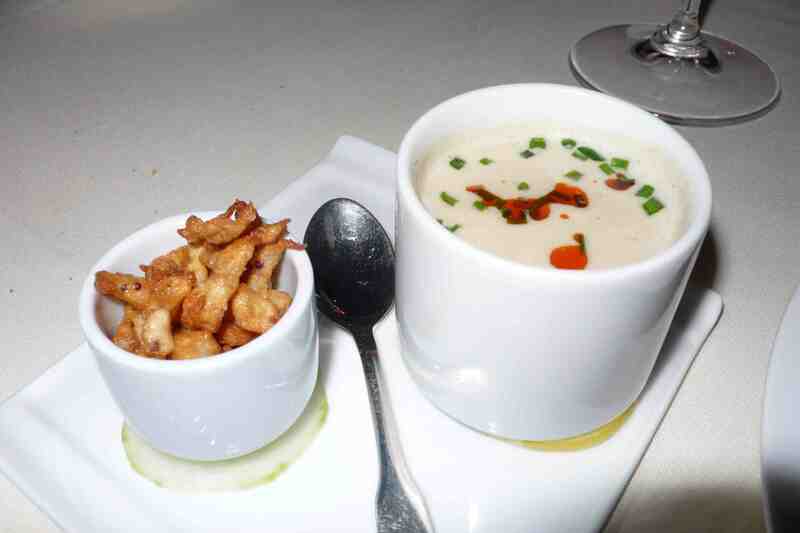 Next came a pairing of two of my favorite things to eat – truffles and foie gras. 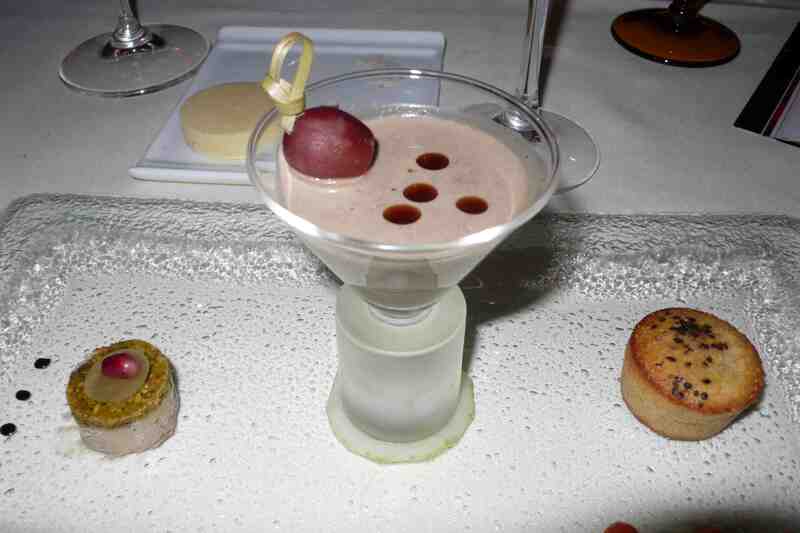 A truffle vichyssoise soup was the centerpiece with a poppysead brioche to the right and a lovely foie gras tower to the left. Yum. 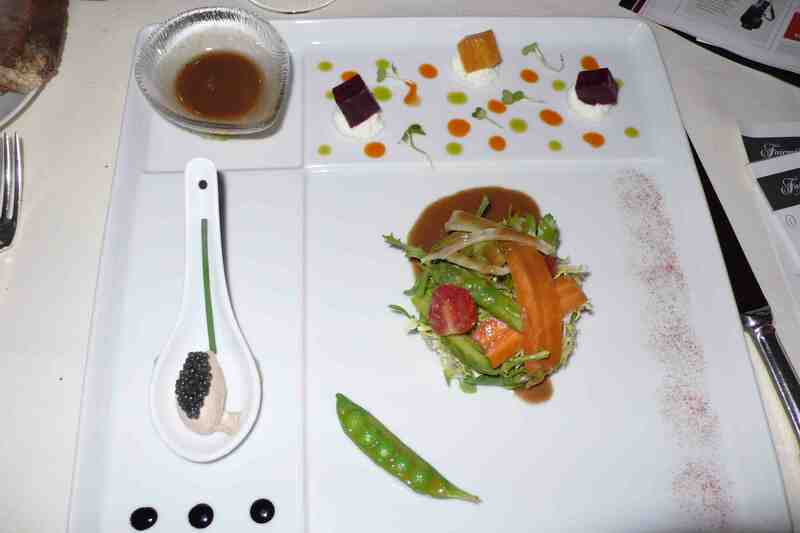 The symphony appetizer was also a delight – a culinary medley of bite size samplings of roasted beet and anchoivies, crab salad with vegetables and a lobster sauce, and foie gras with caviar. 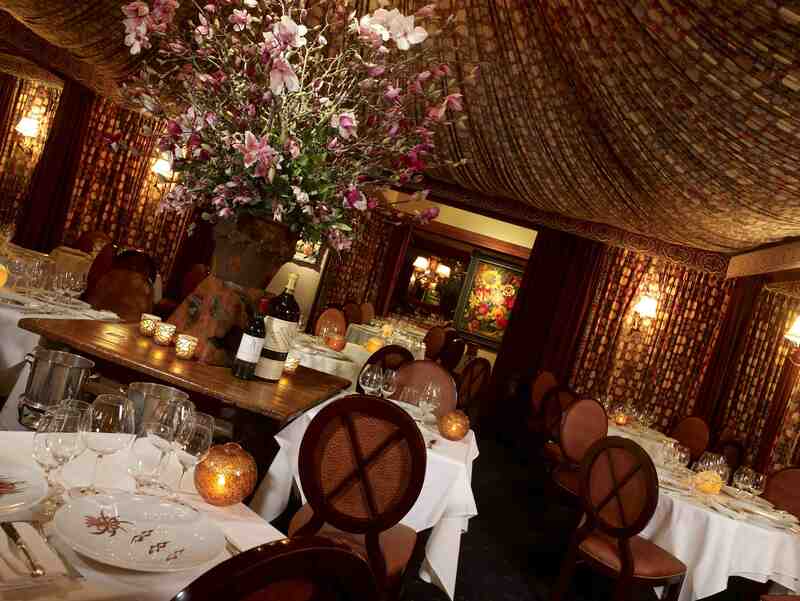 Chef Keller includes generous servings of foie gras, truffles and caviar on many dishes which is sure to delight diners. I loved all samplings on this plate. 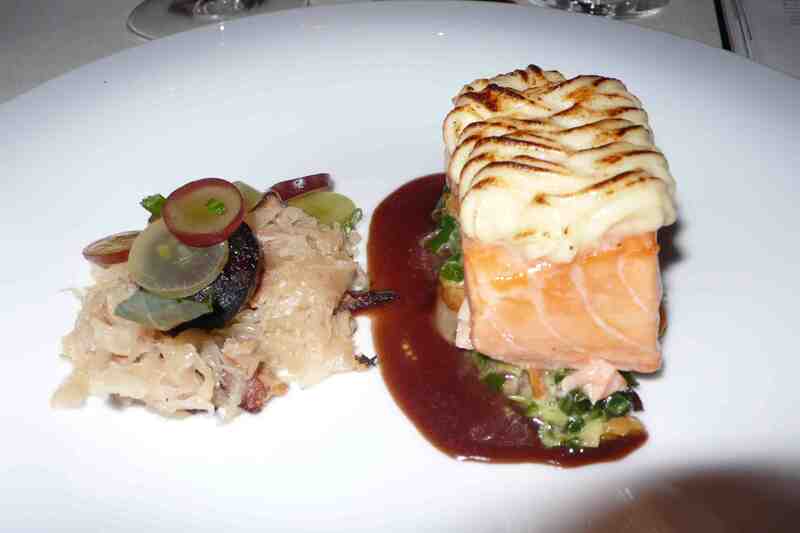 Next came a delicious salmon mousse with vegetables and sauerkraut. The salmon was served with a sauerkraut soup and toasted spatzle (I put these in the soup) and paprika oil. I did not believe that this was sauerkraut soup and had to ask twice. It was indeed made from sauerkraut and was one of the best soup’s I have ever had. I ate every drop of this yummy soup. Sommelier Marcus Garcia paired this with Au Bon Climat Clendenen Family Sauvignon Blanc wine which was a perfect companion to the dish and a wine that I will definitely buy in the future. After the heavenly soup, another surprise came out of the kitchen – pan seared buffalo strip steak with rustic vegetables on a crunchy layer of corn kernals with a lemongrass, ginger and red wine sauce. The buffalo tasted like a tender filet mignon but was much healthier I was told by a waiter. Good thing as I still had a few courses to go. Dessert number one included a butternut squash and ginger foundation with a lemon meringue, cranberry mousse and a cinnamon sauce. yummy. 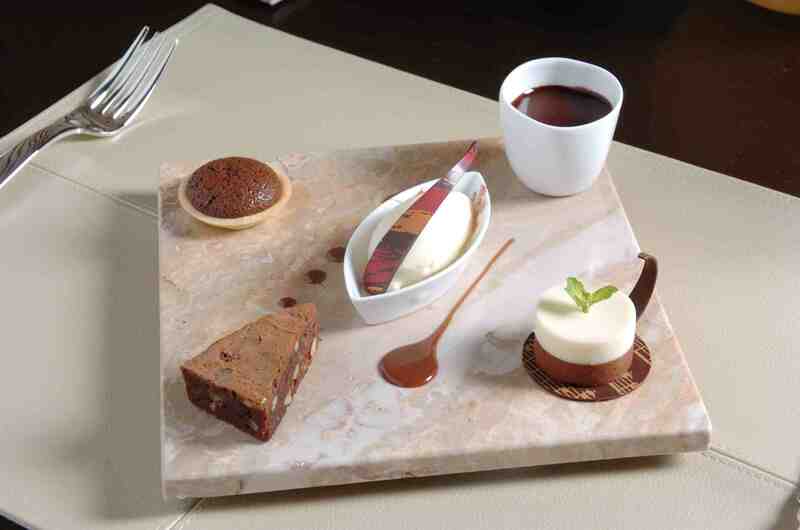 Here is the Chocolate Feast, which includes a variety of Chef Keller’s chocolate creations. I did not have this but had to include the picture, it looks really tasty. 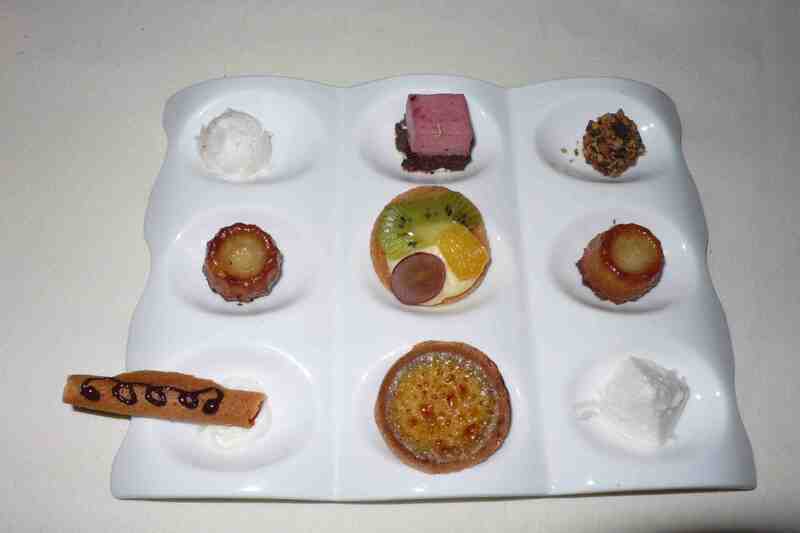 Out came this beautiful assortment of petit fours. Chef Keller began his career as a pastry chef so all desserts, as well as appetizer and main courses, at Fleur de Lys are gorgeous to look at as well as eat. This was so stunning I sat and looked at for a few minutes before trying some of the cakes and pastries. yum. 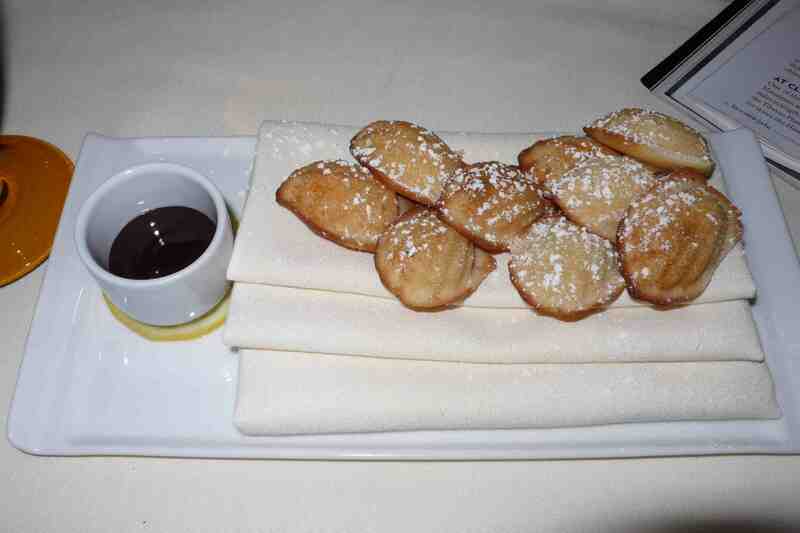 Chef Keller finished off my tasting menu with these lovely madeleines and warm chocolate sauce. Very French. As I gazed around the dining room I found that all diners get these wonderful send offs before leaving the culinary heaven of Fleur de Lys and returning outside the restaurant to reality. In addition to cooking the best meal I have ever had, Chef Keller was nice enough to sit with me for a few minutes and talk about his cooking philosophy and many culinary projects. Our conversation is found in my last post. A native Frenchman, Chef Hubert Keller trained with some of France’s most legendary chefs, including Paul Bocuse and Paul Haeberlin at the L’Auberge de LIll. 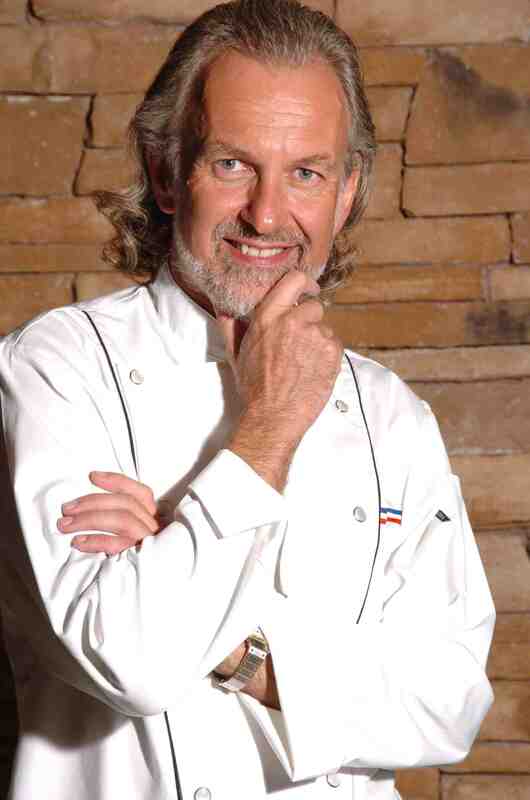 His talents caught the eye of Roger Verge, the Grand Master of French Haute Cuisine, who first made him a chef at Moulin de Mougins on the French Riviera and then appointed him to a two-year stint as Executive Chef at Cuisine du Soleil in San Paulo, Brazil before bringing him to San Francisco to run Sutter 500. 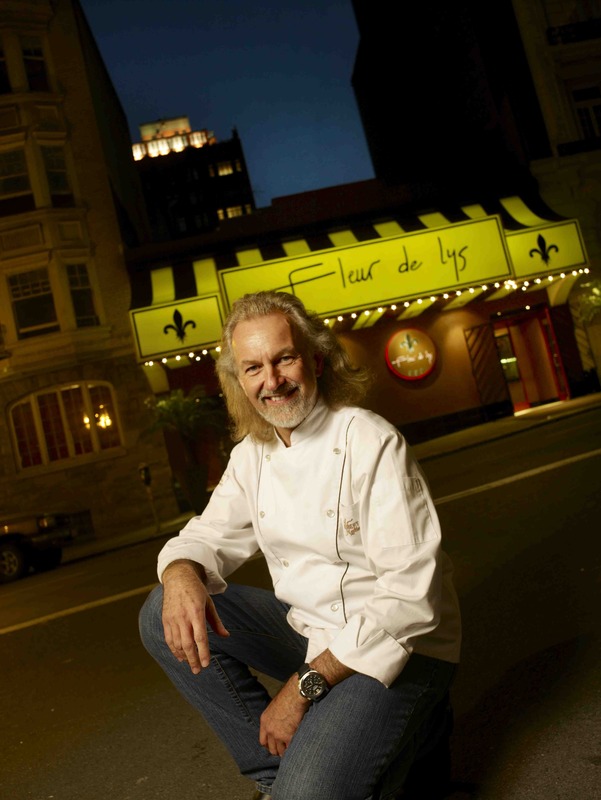 In 1986, Chef Keller became Executive Chef and co-owner of Fleur De Lys, which for 20 years has been one of the cities top fine dining establishments. By the 1990’s, Chef Keller’s reputation reached the White House where he received an invitation to be the first guest chef, preparing a meal for Presdient Clinton and his family. I was fortunate enough to be able to taste (and look at – all Chef Keller’s dishes are expertly plated) many dishes at Fleur de Lys in San Francisco and had the pleasure of sitting down with Chef Keller for a chat after sampling some of the best food I have ever tasted. Here is our discussion. 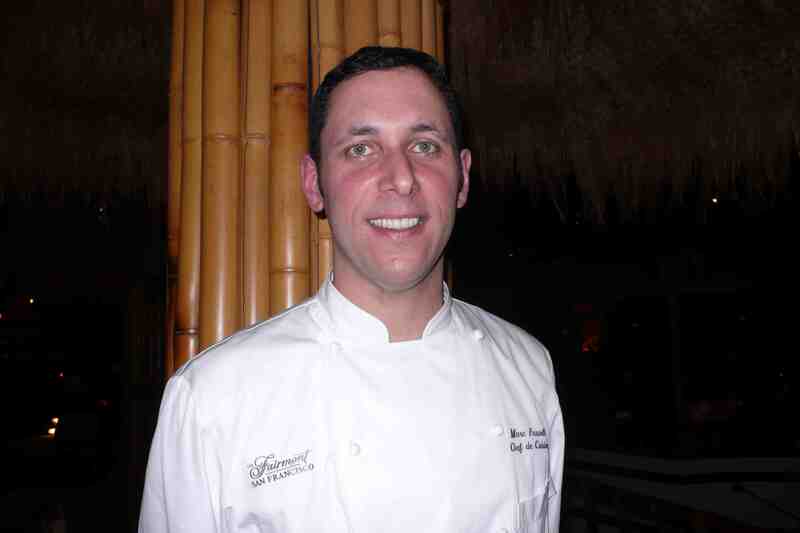 I sat down with Chef de Cuisine Mark Passetti before dining at the Tonga Room at the Fairmont Hotel in San Francisco, here is our conversation. Each year, hundreds of visitors come to San Francisco and fall in love with its unbelievable vistas, graceful architecture, cuisine-defining restaurants and bountiful activities. Along with its many historic and musical associations with love, the city is home to a deeply romantic landscape perfect for inspiring passion. At the crest of Nob Hill sits one of the most romantic places to stay, the historic Fairmont Hotel, commanding views of the bay, Coit Tower and Fisherman’s Wharf. The Italian-Renaissance masterpiece of a grand hotel houses an extravagant lobby with gold-trimmed Corinthian marble columns, crystal chandeliers, a spectacular spiral staircase and rococo furniture. Each of the large 591 rooms share an equally opulent design scheme offering pale color schemes, high ceilings, dark furniture, spectacular city views, oversized marble bathrooms, goose down pillows and large walk-in closets. The hotel’s ornate Laurel Court restaurant is the perfect place for a luxurious afternoon tea or opt for dinner and drinks amidst tiki torches, dancing and a live band at the Polynesian Tonga Room and Lounge. 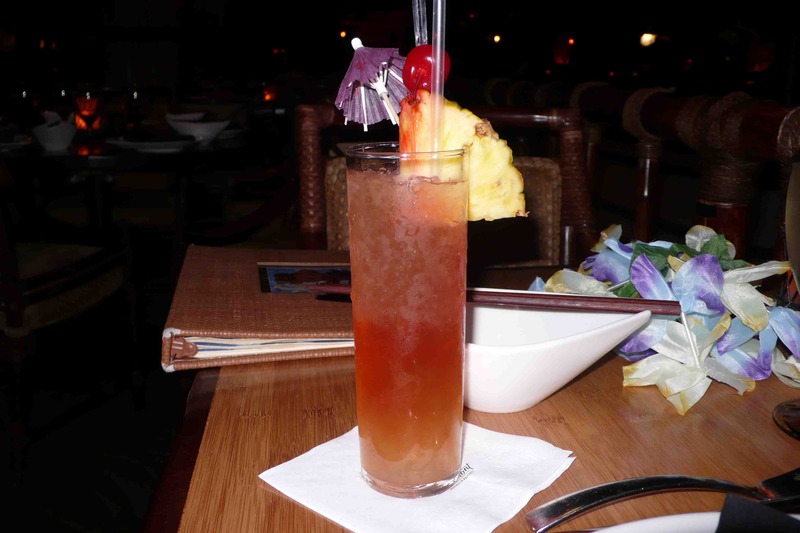 I started off with the Tonga Room’s signature cocktail, The Tonga Itch, made from vodka, pineapple and grenadine. 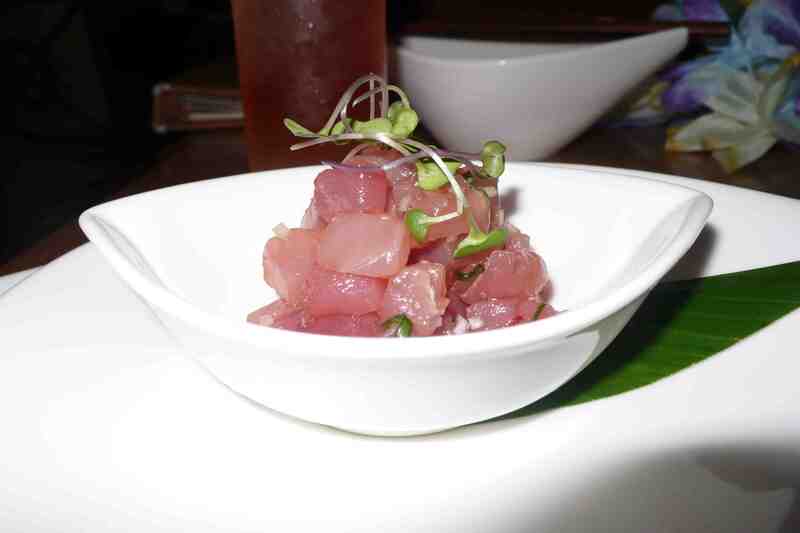 Next came a small bowl of fresh ahi tuna poki, a nice way to start off the meal. 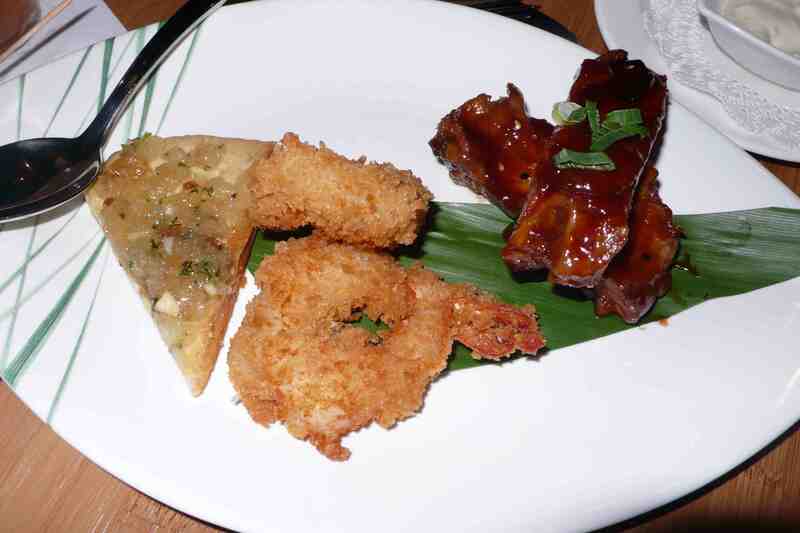 The Tonga Appetizer Platter included spare ribs, coconut panko crusted prawns (my favorite) and a nice flatbread. 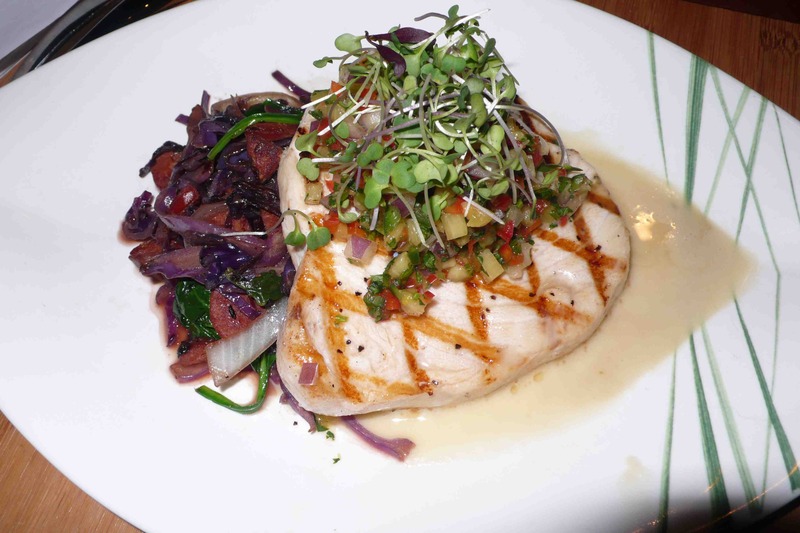 The main course was swordfish with teriyaki vegatables and a fresh pineapple salsa with a cream citrus sauce. 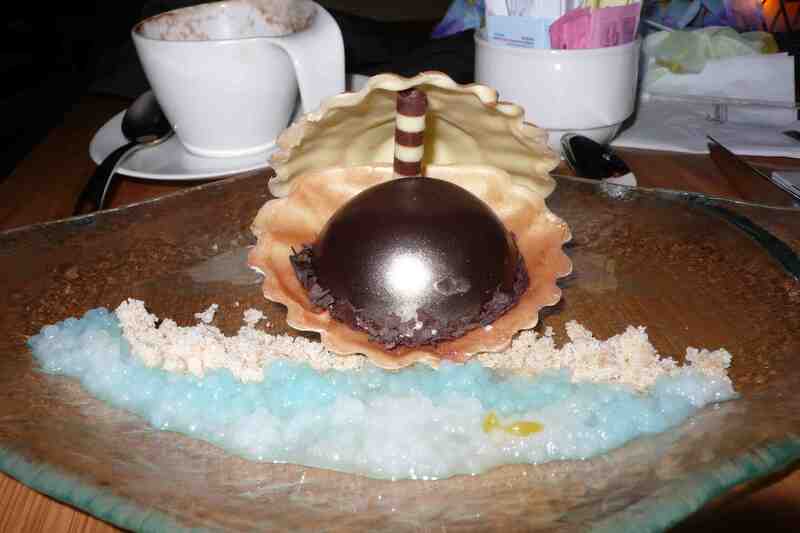 Dessert was the restaurant’s famous white chocolate pearl – chocolate mousse in a white chocolate shell with tapioca.